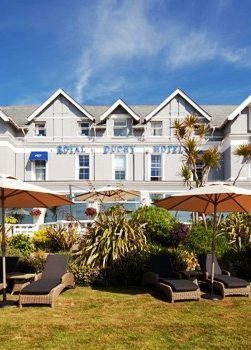 The Royal Duchy Hotel, Falmouth, part of the award winning Brend Hotels group, is one of the finest luxury hotels in Cornwall and the West Country. Traditional in style, it’s perfect for family holidays and always a highly popular choice for weddings and functions. When you stay at the Royal Duchy you’re guaranteed a relaxing break in the popular waterside town of Falmouth. You can chill out on the sun terrace or enjoy a swim in the indoor heated pool. Pamper yourself in the sauna, or book a relaxing treatment with our therapist. This luxurious hotel offers you a wide choice of bedrooms. You can opt for sheer luxury, with a beautifully furnished deluxe room with stunning views of the seafront and Cornwall coast. If you’re a family, there are generous rooms with plenty of space for extra beds and cots. At the end of a busy day exploring Falmouth and enjoying Cornwall’s wealth of attractions, you can relax and watch the sun go down from our seafacing lounges or our outdoor terrace is the perfect spot on a summers evening. Dining at the Royal Duchy, Falmouth is always a pleasure. Each day our team of AA rosette-winning chefs create mouth-watering dishes from fresh, local ingredients to be served in the elegant surroundings of the Pendennis Restaurant. 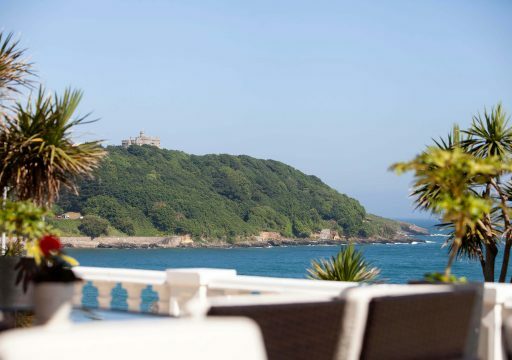 Located on the seafront and with dramatic views across the bay, the hotel is the perfect base for exploring the glorious Cornish coast with its secret coves and picturesque fishing villages.